Nintendo of Canada's tweet - "Tune in 2/13 at 2pm PT for a Nintendo Direct featuring around 35 minutes of information on upcoming #NintendoSwitch titles, including new details on #FireEmblem Three Houses! " 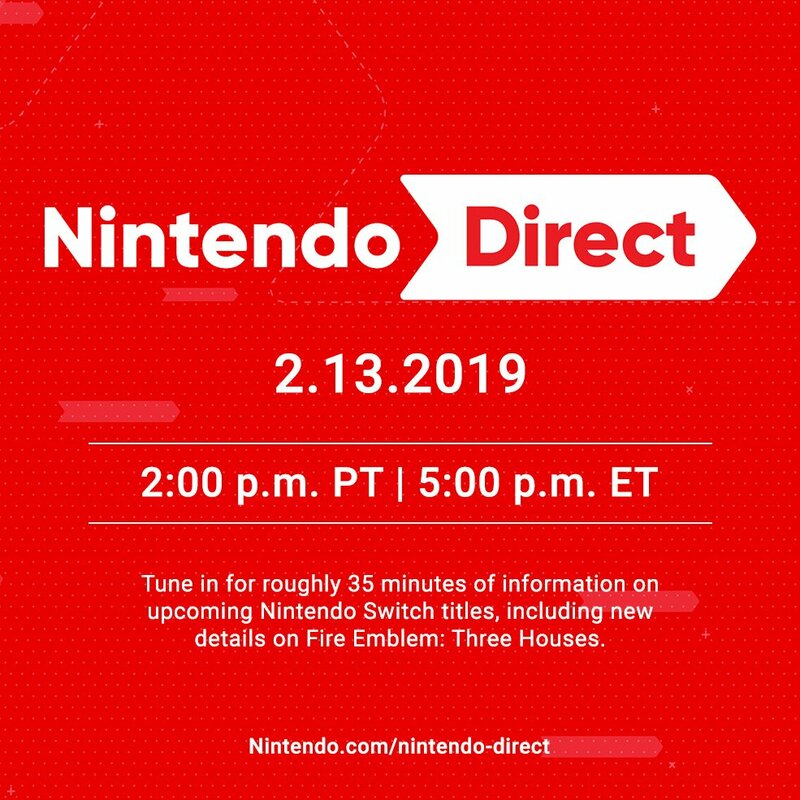 Tune in 2/13 at 2pm PT for a Nintendo Direct featuring around 35 minutes of information on upcoming #NintendoSwitch titles, including new details on #FireEmblem Three Houses! that looks like a lucky emblem! 🔴 Le premier Nintendo Direct de 2019 aura lieu demain! Well there it is. Shame it's starting right when my work is ending. Maybe I'll put it on in the background. There it is... All you ungrateful's happy now? Hope it’s Super Mario Maker deluxe. Watched Three Houses trailer like 2 days ago asking myself 'When?' AND LOOK AT THAT! So I will be leaving work late tomorrow. Metroid Trilogy release or we riot! Yay! I'll be done with classes by the time it happens. Might be on my way home from work at that time so might need to experience it through Twitter. Oooo 6:30 pm my time. I thought it would air whilst at work but this is good. Waluigi DLC or I’m out. Aw yeah, this is happening. Best early Valentine’s Day gift ever! I HOPE THERES ANIMAL CROSSING NEWS!!! !